What better Father’s Day gift is there than some time away from home, being pampered and being a guy? Going to the barbershop used to be quite an experience for men—it was the ultimate clubhouse, a place where guys could be guys. In the Middle ages, you could go into a barbershop, shoot the breeze, get a haircut and undergo major surgery. Your barber was your friend, personal groomer and—frighteningly enough—your surgeon. The red and white-striped pole represented a surgeon’s bandages. Of course, it’s been a long time since a barber worked on somebody’s ulcer. But up until a few decades ago, barbershops remained place for guys young and old to do their things. To say the things that they couldn’t say at home. To be men. “Barbershops used to be the third place beside work and home where a guy could hang out,” says Chopperz Non-Salon owner Marco Sison. “But they never evolved. The old-school shops still assume guys still get the same haircuts as they did 60 years ago.” Sison’s Non-salon (emphasis on the Non) is a perfect middle ground for male grooming. The Portland area is rife with places for male pampering, as well as trendy barbershops. And while barbershops like Bishop’s and Rudy’s are a great place for a cut, it’s an in-and-out deal, not an experience. Chopperz, Sison says, is geared toward the everyman. “There are terms like ‘male spa.’ To me, they still look like the same thing (as a female salon),” says Sison. “When was the last time you were hanging out with your buddies and you said, ‘hey guys, let’s go get a pedicure?’ I don’t care what a salon says about being unisex. 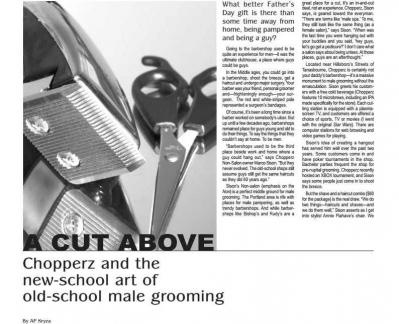 At those places, guys are an afterthought.” Located near Hillsboro’s Streets of Tanasbourne, Chopperz is certainly not your daddy’s barbershop—it’s a massive monument to male grooming without the emasculation. Sison greets his customers with a free cold beverage (Chopperz features 10 microbrews, including an IPA made specifically for the store). Each cutting station is equipped with a plasmascreen TV, and customers are offered a choice of sports, TV or movies (I went with the original Star Wars). There are computer stations for web browsing and video games for playing. Sison’s idea of creating a hangout has served him well over the past two years. Some customers come in and have poker tournaments in the shop. Bachelor parties frequent the shop for pre-nuptial grooming. Chopperz recently hosted an XBOX tournament, and Sison says some people just come in to shoot the breeze. But the shave and a haircut combo ($60 for the package) is the real draw. “We do two things—haircuts and shaves—and we do them well,” Sison asserts as I get into stylist Annie Flahave’s chair. We shoot the breeze about Star Wars as Annie quickly and efficiently cuts my semi-mullet and takes me to the sink for a shampoo. She massages conditioner into my scalp, careful to make sure that the water isn’t too hot before moving on to the main event. I’ve never had a straight-razor shave, and I must admit I’m a bit nervous. I picture Annie, wild-eyed, pulling a rusty razor out of a dirty bucket. She notes my edginess, and explains that all Chopperz personnel had to undergo extensive training with a razor master. That training is rare—in fact, straight razor shaves aren’t allowed in many states. “Most people fall asleep,” she says as she wraps my face in a hot towel. And she isn’t kidding. After some towel time, she massages my face with some pre-shave oil “to make the hairs stand up.” Another towel, and this time I get a scalp and shoulder massage. After about 20 minutes of relaxing, Annie lathers my face and begins to gently shave every portion of my face with a shiny razor imported from Japan. She hits every nook and cranny as I start to drift off. When it’s finished, I get one more towel wrap and rub.